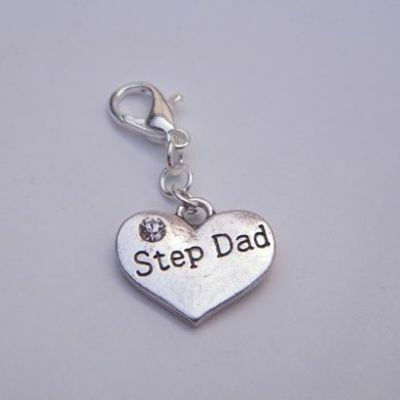 Step Dad Clip On Charm. Lovely Gift Idea to be attached to a Bracelet, Gift Bag or anything with a Zip. The Clip and Fixings are Silver Plated. The Charms are made from different metals depending on the one you choose, most are Tibetan Silver, Silver Plated or Metal Alloy. The Clip is roughly 1cm in size, and the charms are between 5mm to 1.5cm - depending on which one you choose. Clip on charms are perfect for attaching to Charm Bracelets, but they can also be attached to many different things! For example, they can be added to Gift Bags or Party Favour Bags. Clip on charms can be attached to anything with a Zip, such as a Purse, Handbag, Make Up Bag, Pencil Case, Camera Case, School Bag, Laptop Bag. Clip on charms are also great for adding a bit of Wedding Sparkle on a Bouquet, Button Hole or Garter. With so many Charms to choose from, you'll be spoilt for choice! Perfect to use as Gifts for any occasion. All our Clip On Charms are Handmade to order by Retro Wishes in the UK.